Moms on the Run is an instructor-led fitness program with coaching to motivate, educate and encourage you on your journey. You’ll make new friends, find accountability and have fun while working toward a healthier lifestyle. Our 18-week Signature Training Program offers programming for walkers to beginning runners to experienced runners. We offer classes with cardiovascular interval training for all levels concluding with a brief strength training component. Walkers will be encouraged to follow an interval training schedule designed to maximize their fitness levels. We also offer weekly steady paced cardio classes designed to help build endurance and offer an option to increasing mileage. We have marathon and half marathon training plans that integrate with our program to provide the support and accountability you need to reach your goals. From walkers to runners, women will start at their own level and progress throughout the season. Click any button below to view additional payment options - pay in advance and save! All options include 18 weeks of classes and a performance tee or tank. ​Attend 1 interval training session a week with an add-on endurance run. Our signature training classes use cardio intervals to improve metabolism and cardiovascular fitness. 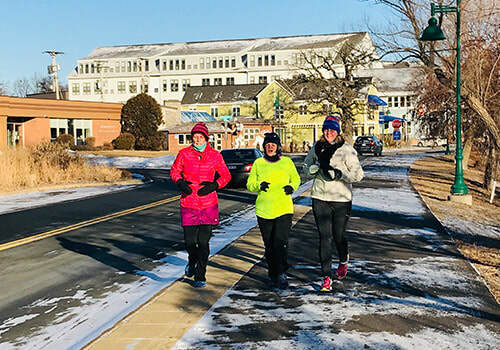 Beginning runners will learn to run, moving from mostly walking to running as they progress through the 18-week program. More experienced runners will use intervals to improve their running speed and fitness levels. A short strength training component, stretching and education concludes the class. Moms on the Run offers training programs to current customers who are training for a marathon or half marathon. Our training plans have been designed by our National Fitness Director, Olympian Carrie Tollefson. These plans are designed to fit seamlessly into the class schedule for our 18-Week Signature Training Program. ​My name is Erin and I was excited to join the coaching team last year after being involved for 7 years! In 2011, I learned to run in Moms on the Run and it quickly became very therapeutic for me. 10 miles is my favorite racing distance and I completed my first marathon in 2018! I am 41 years old, married and a mom of a 13 year old boy and 14 year old girl. My full-time job is as an Office Manager for a commercial tire company. In my spare time, I enjoy reading, crocheting, hiking and boating. I will be certifying as a run instructor this spring, and I look forward to helping many women in the local area develop a new love for running and reach their goals, especially those brand new to the sport. Check back for official start date! Don't let the cold Minnesota winters scare you away from getting a great workout! Our Polar Run Club offers you the chance to maintain the strength and conditioning you built over the summer and fall. We'll layer up and keep up your endurance with outdoor weekend runs.